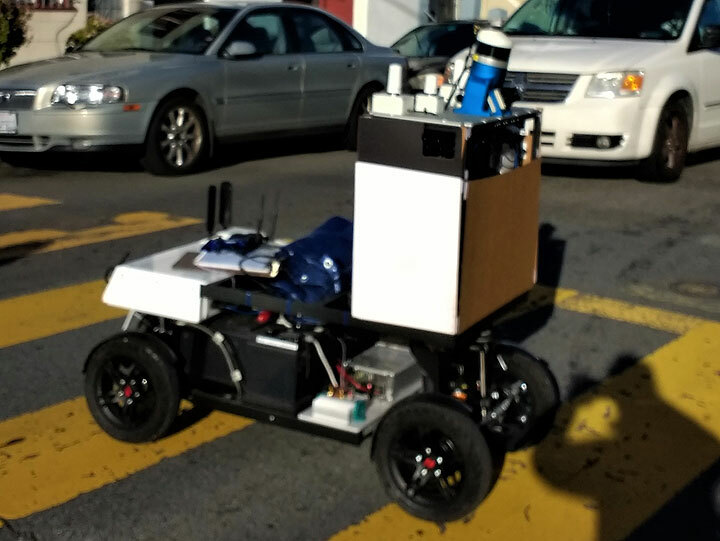 Mysterious robot being test-driven through the Mission District, February 2017. I saw the robot before it saw me: it looked like a cross between a Travel Pro 3-Wheel(™) mobility scooter, the kind my elderly cousin uses, and a mini-fridge. Upon closer inspection it appeared to be a hastily assembled, somewhat jerry-rigged robot: not top shelf, really. More bargain-basement. A man was trotting along after it, in the way of a pet owner chasing his unleashed dog. I biked up to the man. “Can I ask you what that is?” I asked, knowing which answer I’d get. This is the New Mission: no one talks about their business, particularly if it’s funded with venture capital. The man, who had long, slightly stringy brown hair and brown eyes smiled. “I can't tell you," he replied. "Sorry." I smiled back at him. I wasn't surprised. 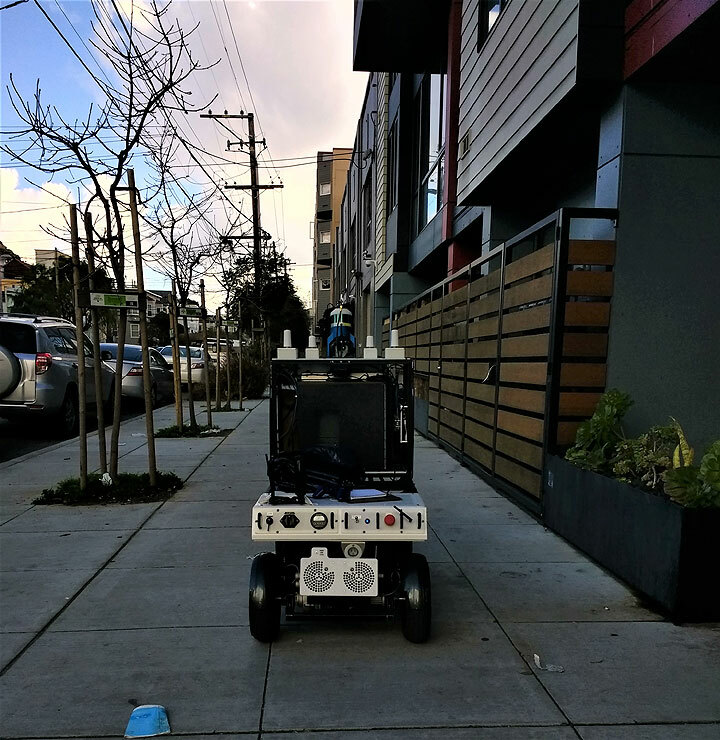 The Mission District is in the grips of a massive Non-Disclosure Agreement these days: automated cars and robots are common sights on sidewalks and streets, and yet no one can or will tell you what they are or what they are meant to do. “Yeah, maybe one of those. But really: I can’t tell you,” he said. 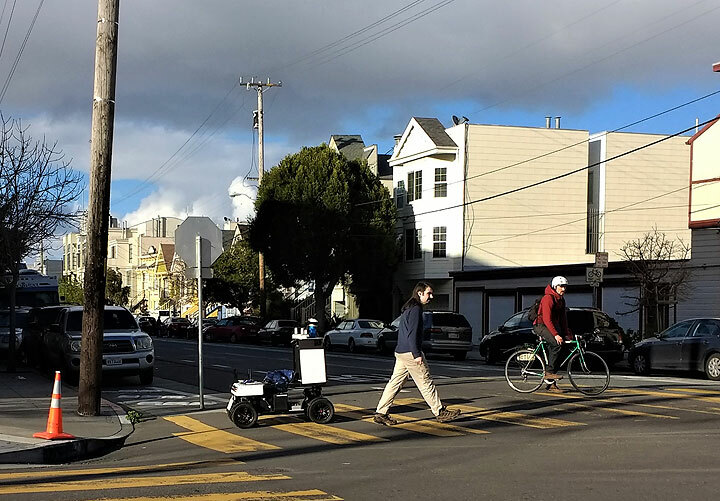 I’d been primed for this encounter by a Mission Local story written by journalist Laura Wenus about a “Carry” robot—a different one than the one I was looking at— that she encountered on Valencia Street. Tech companies are routinely using streets and now sidewalks to test and develop and profit from their technology, and yet none of them will disclose what they’re doing. The proprietary and secretive technology... in public! “This is meant to be a delivery system, right?” I said, adding “Bye-bye subsistence capitalism!” He laughed uncomfortably. “Yeah, right. This will definitely take someone’s job. Well…” he shrugged his shoulders. What are you going to do? “How do you feel about tech firms using public space to develop their technology?” I asked the robot wrangler. We were having this discussion on Alabama street, which has the distinction of having some of the oldest houses in the Mission District lining its streets. A PG&E serviceman was kneeling on the sidewalk in front of a cottage built in 1862, attending to some subterranean problem. The robot zoomed gaily ahead. "You gotta be careful,” said the man. I realized with a start that he was talking to someone else. "Are you controlling this thing?" I asked. “No. Someone back at headquarters is,” he said. The worker saw the wheelchair-mini-fridge contraption coming his way and sat back on his haunches. His eyes widened. "Whoa!" he said. "Is that a robot?" "Yes it is,” said the man, whom I had started to think of as the robot wrangler. “What is it?” asked the PG&E repairman. "I can’t tell you,” said the wrangler, who looked a panicked. I could see him wondering about my persistence. When is she going to leave me alone? The robot had moved confidently down 23rd, turning right on Harrison and made a beeline for the intersection of 22nd and Harrison. “That's quite a curb," the man muttered into his headset. The robot made its way into the crosswalk and, tottering a bit, managed to mount the curb cut. It veered around the woman who sits on the corner selling oranges. She eyed it with calm suspicion. “Naranjas?” she asked to the robot wrangler as he herded it across the intersection. “Do you think that companies that use public resources should pay for the privilege of using public sites to develop their technology?” I asked the wrangler. I wasn’t surprised by his answer: this is the era of the Libertarian New Deal which has evolved a formula exactly opposite to the three R’s: instead of Relief, Recovery, and Reform, it’s Deny, Deconstruct, and Dissemble. Small “l” Libertarianism, as I’ve seen it practiced by start-ups in the Mission District, is avoidant, anonymous and prefers to to create things—cars and miscellaneous gadgetry—that tightly circumscribe private space. This is how I view “innovations” like automated vehicles; the self-driving cars Cruise Automation has spent the last two years test driving around the Mission (and I do mean around, and around and around, in dizzying regularity) function like private BART cars. Included in this avoidance of common space is a suspicion of public safeguards, permits, in other words. Uber’s decision to place their driverless cars on San Francisco streets in defiance of California’s entirely reasonable vehicle permitting laws is a perfect example of the tantrumy we’ll-do-what-we-want-to-do-you’re-not-the-mother-of-me reaction to public safety laws. I asked the robot wrangler if the anonymous tech company had checked in with the city or sought any sort of permitting. “No,” he answered. I recounted this conversation a day later to Nicole Ferrara, Executive Director of Walk SF who said immediately: “They are not legal. They are not permitted to be on the sidewalk.” She’d read the February 21st Mission Local story about the “Carry” robot, and thought I had seen the same robot. The robot and the wrangler crossed the street and entered the crosswalk. I decided it was time to stop talking and start documenting. I laid my bike down next to the woman selling oranges and grabbed my cell phone. “I don't want to be in the picture,” said the wrangler. “I can crop you out,” I said and then thought wait a minute. He's walking around with this thing on a public sidewalk. Sorry, guy. The robot vroomed past me and churned down Harrison street. The conversation with the wrangler was over. He was nice, but I knew there was nothing for me to know; all I was required to do was watch the spectacle of a robot, zooming through my neighborhood. But I followed them, anyway. We came to the corner of 23rd and Harrison. A nattily dressed man wearing a porkpie hat stood on the street corner. His eyes lit on the robot and his eyes widened. “Woah! Is that a robot?” he asked. “Yes!” I said, answering for the wrangler, who was busy running after the robot. He looked happy. “Is that like R2D2's great-great-great-great Grandfather?” he asked gleefully. His name was Eric Peralta. “I'm a furniture designer and sci-fi geek,” he told me. He was enchanted by the robot. “Do you want to know what that is?” I asked Eric. “Yeah! Hey! What is that?” Eric called after the wrangler. “I can’t tell you,” answered the wrangler. He and the robot zoomed off. Eric’s eyes were alight: the future was all around him in the Mission and it was awesome. Eric, a self-identified extreme-Left-Libertarian didn’t see a problem with the robot’s developers using the sidewalks and streets for product development or financial profit. “That’s what most companies do, right?” Neither did he mind the secrecy of tech culture. “When you’re working on sensitive technology, you need to be able to protect your design to keep your work from being stolen.” Who’d want to steal that thing? I wondered. What evil tech competitor would be interested? It looked so slapped together a Jawa might have second thoughts about scavenging it. 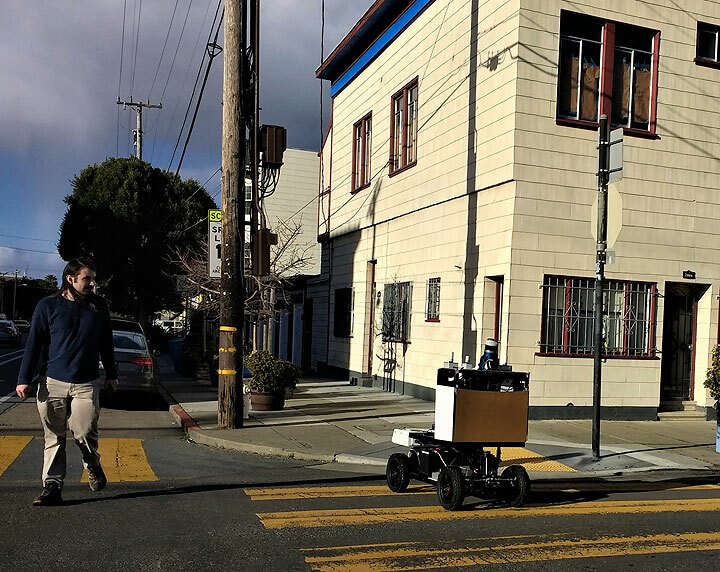 In comparison, the “Carry” robot that Wenus encountered looked sleek, definitively high-tech and convincing in its role as the delivery person of tomorrow. Eric looked thoughtful as he gazed at the rapidly vanishing robot. “It’s strange to be alive in this time. I can remember when computers were barely a thing…they fit in closets, not people’s hands. I grew up in the forest and love nature, love the environment. But the earth has become a human sphere. We are changing it.” He seemed to think that the future was upon us, in all its glory, unmovable, unchangeable and suddenly just present. I felt differently, of course: the future that tech companies seem to be building seems to be concerned with banishing the quotidian in favor of a future free of human activity and monopolizing my immediate environment with a monoculture of non-disclosure and anonymity. Gee, no thanks. Like St. Joan of the Stockyards, I Want To Know. What seems to be at-large in the streets of the Mission district (aside from unpermitted robots) is a culture that is at once voluble, and cagey: the public humble-brag and carefully scripted candor of the tech community when it speaks of the future at tech conferences or to the media vanishes when you encounter tech engineers roaming around the Mission District sitting inside self-driving cars or running after robots. They are legally and culturally tongue-tied. When asked what they’re doing, and what the things they’re developing will do, they can only say I can’t tell you. This is probably the truth. They probably don’t know. Which is weird. An opaque, undisclosed future is at odds with the kind of Futurism I grew up with. It took delight in explaining everything: there will be ansibles, veldts, holo-decks. There will be genderless societies, black obelisks, undiscovered galaxies far, far away, monsters made from cadavers who need to be loved, tiny green people in elongated spaceships that either want peace or to destroy us. The authors and writers of the movies and the books I love (I’m a sci-fi geek, too) are in the business of description: new worlds, relationships, and environments. Some of the stories were cautionary. Some were frightening. But the makers of these scenarios wanted me to consider, to anticipate, to know. The tech community of the Bay Area do not. They only ever show a bizarre mix of squeamishness and surprise—You’re only here to witness. We Can’t Tell You— as they develop an undisclosed future on the streets of my neighborhood.